Marcus Thompson has appeared as viola soloist, recitalist and chamber music player in series throughout the Americas, Europe and the Far East. He was featured as soloist with the Symphony Orchestras of Atlanta, Chicago, Cleveland, Philadelphia, Saint Louis, and the Czech National Symphony. He has recorded the Bartok Viola Concerto and the Bloch Suite with the Slovenian Radio Symphony and the Tibor Serly Concerto, Jongen Suite and Francaix Rhapsodie with the Czech National Symphony, both conducted by Paul Freeman. 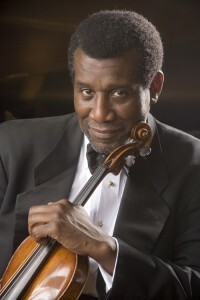 Mr. Thompson has received critical acclaim for performances of the John Harbison Viola Concerto with the Los Angeles Chamber Orchestra and with the Chicago Sinfonietta, and for performances of the Penderecki Viola Concerto in Boston and London. His solo repertoire includes the recent, Ligeti, Overton, Schnittke, as well as the exotic with works by Ariosti, Vivaldi and Hindemith performed on the viola d’amore. He has been a guest of the Audubon, Borromeo, Cleveland, Emerson, Jupiter, Muir, Orion, Shanghai, and Miami String Quartets, the Chamber Music Society of Lincoln Center; and a frequent participant in chamber music festivals in Amsterdam, Anchorage, Dubrovnik, Montreal, Seattle, Sitka, Los Angeles, Okinawa, Portland and Vail. Mr. Thompson, who is a member of the Boston Chamber Music Society, earned the doctorate degree at The Juilliard School following studies with Walter Trampler. He is an alumnus of Young Concert Artists, Inc.
Born and raised in The Bronx, N.Y.C., he currently lives in Boston where, as the Robert R. Taylor Professor of Music and a Margaret MacVicar Faculty Fellow, he founded and leads programs in chamber music and performance study at MIT, and serves on the viola faculty at New England Conservatory of Music.